The importance to practicing nephrologists of lupus nephritis (1, 2, 3) is that, although rare, it is a serious disease whose prognosis can usually be improved dramatically by treatment, but for which the treatment is potentially toxic, prolonged, complex, and difficult to plan and carry out. Lupus is defined by its clinical picture, together with antibodies directed against one or more nuclear components, particularly anti-double-stranded DNA (dsDNA). It is best regarded as a syndrome, in which a variety of immunologic events may lead to a similar final common pathway, and thus present a similar clinical picture (4). One important distortion that occurs through the usual style of reporting of lupus in the literature is that by defining “typical” or “core” patients with a positive antinuclear antibody and/or dsDNA antibodies, a considerable number of patients are excluded who belong to the lupus “family” of diseases, but do not satisfy current strict criteria. These patients are in practice as important to recognize and treat as those with “classical” lupus. Many with a clinical lupus syndrome but a negative antinuclear antibody have low titers of anti-Ro antibody; this subset of patients rarely has significant renal disease, but often has a high incidence of antiphospholipid antibodies and associated thromboses and abortions (see below), as well as inherited complement deficiencies. How autoimmunity and the lupus syndrome may arise remains the subject of speculation (5). In lupus, a generalized autoimmunity is present with autoantibodies directed against a variety of self components (6), and the role of the autoantibodies in generating the organ damage is unclear. This contrasts with organ-specific autoimmunity such as that found in myasthenia gravis or anti-glomerular basement membrane nephritis, in which clearly pathogenic autoantibodies are directed against a single self epitope. Genetic factors are important in lupus, with a strong racial preponderance. For instance, the prevalence and mortality of lupus are both ten times higher in black (American) women than whites; however, it is relatively rare in the progenitors of Afro-Americans in West Africa. Familial clustering of lupus is present also, and monozygotic twins show a 25% concordance. In addition, patients with lupus may have healthy family members who show antinuclear and other autoantibodies. However, only weak associations have been noted with MHC loci, the strongest being with genes for C4A or C4B or low production of tumor necrosis factor. A few lupus patients also have genetic deficiencies of complement components. Acquired complement deficiencies are also associated with lupus, for example of the complement receptor CR-1. A female phenotype is the major risk factor for the development of lupus. The female:male ratio rises from 2:1 in prepubertal children up to 4.5:1 in adolescence to the 8 to 12:1 reported in series of adult onset patients, falling back to 2:1 in patients over 60 yr of age. These data are in accord with murine models of lupus, in which estrogens are precipitating factors in the emergence of lupus, while androgens protect. Lupus is distinctly rare before puberty, although onset in the first year of life has been recorded. Overall incidence is much lower in children compared with adults. Infective agents, including historically tuberculosis and more recently retroviruses, have been considered as candidates for the provocation of the lupus syndrome; however, there is no convincing evidence of their participation in human disease. Medicines, of which hydralazine and procainamide are prototypes, may precipitate a lupus syndrome, but they rarely affect the kidney. Immune aggregates are present at sites of injury in glomeruli, and in the tubules also in about two-thirds of renal biopsies, as are complement components. Whether these are derived from circulating complexes or from in situ combination of antigen and antibody is still unclear. Deficiencies in the handling of immune complexes and other foreign material have been described, perhaps inherited in association with the MHC haplotype HLA-A1-B8-DR3. This deficiency may be worsened by “saturation” of the monocyte-phagocytic system by immune aggregates, either free in the circulation or fixed to CR-1 receptors stripped from erythrocytes. Typically, there are multiple autoantibodies in lupus directed against nucleic acids and proteins concerned with intracellular transcriptional and translational machinery (6): The main targets are nucleosomes (DNA-histone) (7) or even quaternary antigens on the chromatin itself, small nuclear ribonucleoproteins and small cytoplasmic ribonucleoproteins. Patients with lupus nephritis usually show antibodies directed against dsDNA, Sm, and C1q (see below). It remains uncertain whether the DNA- anti-DNA antibody system, so characteristic of lupus, has a direct role in pathogenesis. There is no reason to believe that the effector mechanisms of renal damage (complement, polymorphs, monocytes, cytokines, eicosanoids, etc.) are different in lupus from primary glomerulonephritis, but the interstitial cellular infiltrates in lupus often show an excess of CD8+ cytotoxic T lymphocytes over CD4+, compared with the usual majority of CD4+ T-helper lymphocytes and monocytes seen in primary glomerulonephritis. Why do only some patients with lupus develop clinically evident nephritis? Those with nephritis usually have antibodies directed against dsDNA as well as single-stranded DNA, and have at most low titers of anti-Ro and anti-La antibody. They also have high avidity anti-DNA antibodies that activate complement strongly. Higher avidity anti-DNA antibodies also occur in proliferative more than membranous lupus nephritis, and cationic antibodies appear to be more pathogenic. Antibodies directed against C1q are more frequent in those with nephritis also. Nephrologists often forget that only 25 to 50% of unselected patients with lupus have abnormalities of urine or renal function early in their course, although up to 60% of adults and 80% of children may develop overt renal abnormalities later. In those over 50 yr of age at onset, less than 5% have nephritis initially. The dominant feature of renal lupus is proteinuria (Table 1), present in almost every patient and commonly leading to the nephrotic syndrome. Microscopic hematuria is almost always present, but never in isolation; macroscopic hematuria is rare. Surprisingly, hypertension is not overall more common in those with nephritis than in those without; but, as expected, those with more severe nephritis are more commonly hypertensive. About half will show a reduced GFR, and occasional patients present with acute renal failure. Renal tubular function is disturbed, which is not surprising in view of the finding of both immune aggregates in tubular basement membranes and the presence of interstitial nephritis (see below). In a high proportion of patients, urinary excretion of light chains and β2-microglobulin are both increased. Recently, hyperkalemic renal tubular acidosis has been emphasized as a manifestation of lupus (8). Because lupus is a systemic disease, the management of the nephritis must be seen as part of the whole management of the lupus syndrome. In some patients, the effects of the extrarenal disease will dominate, and all nephrologists need to be skilled in the early recognition, diagnosis, and treatment of lupus affecting other body systems. The initial complaints are usually nonrenal, even in patients who later develop severe nephritis, although a small number of patients develop what initially appears to be an idiopathic nephritis and then develop lupus. The major features of lupus in other organ systems are described in detail in texts on lupus in general (2, 3). The most important and serious is neuropsychiatric lupus (9). Antinuclear antibodies, particularly those against dsDNA and the Smith (Sm) antigen, are strongly associated with the presence of nephritis (Table 2). The Smith (anti-Sm) antibody is highly specific, but present only in 15 to 50% of patients with nephritis, more in Afro-Caribbean patients than in Caucasians. Treatment may rapidly eliminate anti-dsDNA antibodies from the circulation, while the positivity on the fluorescent antinuclear antibody (FANA) test remains. The various patterns of FANA (diffuse, speckled, etc.) are not reliable in distinguishing lupus from other antinuclear factor-positive disease. Anemia of moderate degree is common, but a positive test for anti-red cell antibodies (Coombs' test) can be obtained only in a minority of patients with lupus, and severe hemolytic anemias are not often seen. Leukopenia (due to anti-white cell antibodies) is common, with 50% of patients having a white cell count below 5000/μl, while thrombocytopenia is found in one-quarter of patients. The origins of the thrombocytopenia are complicated, resulting from accelerated destruction after binding of antiplatelet antibody, sequestration of platelets in the kidneys, and lysis and/or phagocytosis of circulating platelets by reaction of both antiphospholipid antibodies and immune complexes (including dsDNA-anti-dsDNA complexes) with circulating platelets. The doubly misnamed “lupus anticoagulant” activity (10) is based on the presence of antiphospholipid antibodies, directed mainly against the β2-globulin carrier protein rather than the phospholipid itself. These antibodies prolong phospholipid-dependent coagulation studies in vitro, but in vivo are associated with thrombosis. The in vitro mechanisms are clear, but what promotes thrombosis in vivo remains uncertain. Antiphospholipid antibodies can be detected in one-third to one-half of patients with lupus nephritis, and have been associated with renal arterial, venous, and glomerular capillary thrombosis, as well as Libman-Sachs “endocarditis” and cerebral thrombosis. It is important to note that despite the in vitro prolongation of clotting times, it is safe to do needle biopsies in the presence of antiphospholipid antibodies; in contrast, a prolongation of Kaslin Cephalin Time that reverses on mixing with normal plasma is the result of a true lupus anticoagulant, and will require cover with fresh-frozen plasma. These may be antibodies directed against factors leading to fibrin formation, such as factor VIII and IX, but also less commonly factors XI and XII. Other prothrombotic risk factors include depressed release of plasminogen activator and possibly also antagonists of plasmin, decreased plasma concentration of free protein S, and raised von Willebrand factor concentrations. The diagnosis of lupus is usually easy, but about half of patients with lupus are initially suspected of having a disease other than lupus, most commonly rheumatic fever, rheumatoid arthritis, and hemolytic anemia. An index of suspicion helps in obscure cases, especially in unusual circumstances such as a middle-aged nephrotic male, or apparently idiopathic membranous nephropathy in a young woman. It should be routine to screen all proteinuric patients for antinuclear antibodies. Nephritis has been reported in a minority of patients with mixed connective tissue disease (MCTD), but analysis of the antinuclear antibody for the typical anti-Ro and anti-La antibodies of MCTD and the absence of anti-dsDNA antibodies should make the diagnosis clear. Rheumatoid arthritis usually does not show systemic features, but on occasion proteinuria will be induced by one of the drugs used in its treatment and cause additional problems in diagnosis. Some of these patients go on to develop full clinical and immunologic lupus. The presence of erosions and a deforming arthritis makes lupus very unlikely, but does not exclude it. Henoch-Schönlein purpura may be mimicked since the rash of lupus may be purpuric, and can affect the lower limbs only, and a few patients with lupus may have predominant IgA in their renal biopsies with raised serum IgA concentrations. Lupus may on occasion be complicated by a vasculitis, which causes difficulties of diagnosis with other forms of vasculitis, especially when p-antineutrophil cytoplasmic antibodies may seem to be present (see next section). Few clinicians are happy to make a diagnosis of lupus nephritis without some antinuclear antibodies in the serum preferably shown to react with dsDNA (6). “Lupus-like” patients with negative antinuclear antibody tests show little or no renal disease, although there are exceptions and more than 80% of this “fringe” have antiphospholipid antibodies (10). The proportion of positive ANA depends not only on the population studied, but also on the technique used. The classic Farr assay detects only high avidity anti-dsDNA antibodies; enzyme-linked immunosorbent assay also picks up low avidity antibodies, as does the slide Crithidia lucilae kinetoplast test. Correlations with the presence and severity of nephritis are best with high avidity antibodies using the Farr assay, but for screening diagnosis the enzyme-linked immunosorbent assay has advantages because it will detect positives in some FANA-positive patients in whom the Farr assay is negative, but who do have lupus. Anti-Sm antibodies are almost entirely specific for lupus, but are found only in about 30% of patients, and thus have a very low sensitivity. Hypocomplementemia is found at presentation in more than three-quarters of untreated patients with lupus, and is more common with evident nephritis. The concentration of C4 and C1q tends to be more depressed than C3, which suggests complement activation via the classical pathway (which is almost never seen in idiopathic mesangiocapillary nephritis or acute glomerulonephritis, although common in essential cryoglobulinemia). However, concentrations of properdin and factor B are depressed also through secondary activation of the alternative pathway. The interpretation of antineutrophil cytoplasmic antibodies (ANCA) is difficult in the presence of antinuclear antibodies, and may be interpreted as a positive p-ANCA. However, the finding of multiple immunoglobulin deposition, together with complement in the affected glomeruli, and a proliferative/membranous pattern rather than a necrotizing glomerulitis, should cause no diagnostic difficulty. Immune complexes can be detected in the serum of the majority of patients with lupus, especially those with nephritis, and the titer in general rises and falls with indices of clinical activity. However, their utility in diagnosis is minimal since so many other conditions show immune complexes of varying biological activity, and immune complex detection is no longer in routine clinical use. In addition, complement-based tests for “immune complexes” have been shown to measure not immune complexes but anti-C1q autoantibodies. Renal biopsy (11, 12) is worthwhile in all patients with lupus who have abnormal urine and/or reduced renal function because it provides prognostic information and influences initial treatment (see below). The overriding characteristic of lupus nephritis is its variability, between patients, within biopsies, and even within glomeruli. The World Health Organization (WHO) classification of lupus nephritis (12) (Table 3A and 3B), (Figure 1, A through D, and Figure 2, A through D) based on light microscopy is widely accepted, but at best it allows only a general level of severity to be judged. Class III (focal proliferative nephritis) (Figure 1, C and D) is a particular source of difficulty, since it covers such a wide range of appearances. Nevertheless, there is a remarkable similarity in the proportion of patients allocated to each class in different series from all over the world: more than half show WHO class III (focal proliferative) or IV (diffuse proliferative) nephritis (Figure 2, A and B), severe forms which most clinicians would treat vigorously. The proportion of class V (membranous) biopsies is about the same in all series, i.e., 10 to 15% (Figure 2, C and D). (A) Photomicrograph depicting typical appearance of a glomerulus in patient with mesangial type lupus nephritis, WHO class II. (Periodic acid-Schiff stain; magnification, ×200). Courtesy of Dr. Helmut Rennke. (B) Immunofluorescence micrograph of glomerulus illustrating mesangial localization of IgM in WHO class II lupus nephritis. Magnification, ×200. Courtesy of Dr. Helmut Rennke. (C) Illustration depicting a glomerulus with focal necrotizing and proliferative lesion characteristic of WHO class III focal segmental glomerulonephritis. (Silver methenamine stain; magnification, ×260). Courtesy of Dr. C. Craig Tisher. (D) Immunofluoresence micrograph of kidney biopsy from patient with class III lupus nephritis. Segmental localization of IgM is depicted in the glomerulus. Note presence of tubular membrane deposits often observed in lupus nephritis. Magnification, ×160. Courtesy of Dr. C. Craig Tisher. 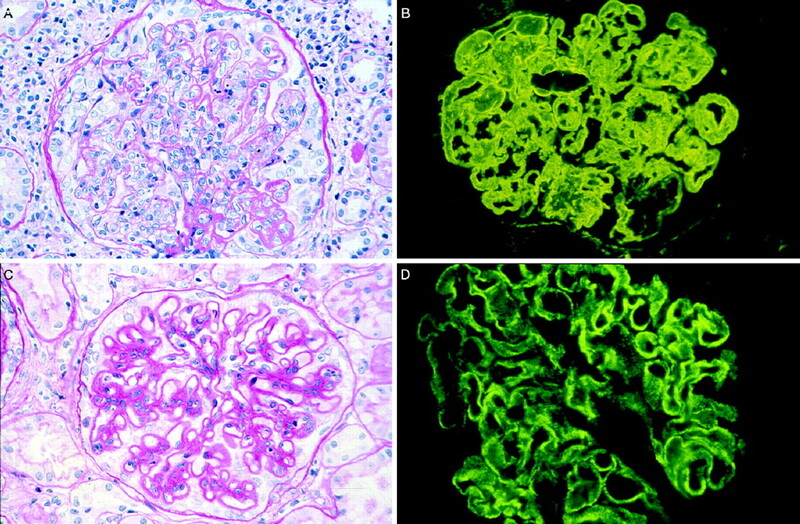 (A) Photograph of glomerulus depicting appearance of WHO class IV lupus nephritis. (Periodic acid-Schiff stain; magnification, ×225). Courtesy of Dr. Helmut Rennke. (B) Immunofluorescence micrograph depicting glomerular IgG localization in kidney biopsy from patient with class IV lupus nephritis. Magnification, ×225. Courtesy of Dr. C. Craig Tisher. (C) Photomicrograph illustrating the typical appearance of WHO class V diffuse membranous glomerulonephritis. (Periodic acid-Schiff stain; magnification, ×200). Courtesy of Dr. Helmut Rennke. (D) Immunofluorescence micrograph illustrating IgG localization in class V lupus nephritis. Magnification, ×260. Courtesy of Dr. Helmut Rennke. On immunohistology, IgG is almost always the dominant immunoglobulin with IgG1 and IgG3 being especially prevalent; however, a few patients show predominant IgA or IgM. Early complement components such as C4 and especially C1q are usually present, along with C3. The finding of positivity for all three isotypes of Ig, together with C3, C4, and C1q (a “full house”), is present in about one-quarter of patients with lupus, and almost never in nonlupus disease. Other immune reactants such as complement components B, C5b-9, properdin, and β1H are also present in many patients. Fibrin, sometimes accompanied by cross-linked fibrin, is often present in class IV biopsies but rare in other classes. In about 50% of patients with nephritis, less in those with class II but in up to three-quarters of those with class IV, immune aggregates are present in the tubular basement membrane (Figure 1D). In an occasional patient, linear tubular immunofluorescence is seen, suggestive of anti-TBM antibodies. The interstitial cellular infiltrate is mainly T lymphocytes and monocytes, with only a few B cells, plasma cells and natural killer cells. Among the T lymphocytes, both CD4+ and CD8+ are present, with the latter being predominant. Active infiltration and invasion of tubules (“tubulitis”) is frequently seen in active disease. In more chronic disease, the interstitium is expanded with a variable amount of collagen. In a few patients, an acute tubulointerstitial nephritis is seen in the absence of glomerular disease and may present as acute renal failure (13). Vascular immune aggregates, hyaline and noninflammatory necrotizing lesions, and true vasculitis with lymphocytic and monocyte infiltration of the vessel wall may all be seen, more rarely intrarenal anteriolar thrombi (14). All of these vascular changes are signs of a poor prognosis (see below), and thus are important to recognize. Occasional patients show overt thrombotic microangiopathy on histologic and hematologic criteria. Correlations have been shown between the presence of antiphospholipid antibodies and intraglomerular thrombi by some observers. Amyloidosis is rare in lupus, consistent with the fact that concentrations of acute-phase proteins such as amyloid A and C-reactive protein do not rise in the plasma during flares of activity in lupus. Dense-deposit disease and pauci-immune necrotizing glomerulitis have been reported in lupus in occasional patients. Serial biopsies show that transformation between WHO classes is quite frequent. Particularly common is transformation from diffuse proliferative glomerulonephritis (class IV) to a predominant membranous (class V) pattern under successful treatment. As renal function improves, proteinuria may become massive under these circumstances. A number of authors have noted that lupus patients without clinical manifestations of nephritis have, in renal biopsies, significant glomerular disease. There have been few follow-up studies on such patients, but one study showed that the majority remain without clinical nephritis for several years. However, it is equally obvious that all patients with clinically evident nephritis must have gone through a period of absent or occult disease before this becomes evident, particularly as the proportion of patients with nephritis at onset is so low; how many of these patients run a subclinical course for a prolonged period is not known. Although histologically more severe glomerular forms of nephritis have a tendency to result in more severe clinical manifestations, renal histology cannot be predicted with any certainty from the clinical picture. In untreated patients, WHO biopsy class is a powerful determinant of outcome. However, this is no longer true if patients with more severe nephritis are given more active treatment (see below). Interstitial changes (both cells and interstitial volume) correlate well with GFR at the time of biopsy, as well as with outcome. Titers of anti-dsDNA antibody were similar in our own patients in all histologic groups, but others have noted significant—but not clinically useful—differences. By the time a renal biopsy is performed, the patient will almost certainly have received some immunosuppressive treatment, which will alter the serologic results. The clinical course of lupus can no longer be considered separately from the results of treatment (1, 15). Thirty or more years ago, few patients with severe grade IV nephritis survived more than a year or two, and half of those with even less severe forms of nephritis used to die within 5 yr (Table 4). There has now been marked improvement in the outcome for patients with class IV biopsies, which today differs little from lupus nephritis as a whole. There seems little doubt that this improvement has been the result of better management of the disease, and this has led to almost all patients with lupus nephritis receiving treatment, including those with the mildest forms. However, the classical data of Ropes (16) must not be forgotten: In the 1960s, she studied 68 nonbiopsied patients with lupus and proteinuria who were left without treatment, and in 16 (28%), the proteinuria became intermittent or disappeared spontaneously. In most patients today, there is a gratifying response to early treatment, followed by relatively quiescent disease under continuing immunosuppression that can be tapered out eventually without further relapse. Another common pattern is the patient rendered quiescent who suddenly relapses. The frequency and intensity of relapses depend not only on the underlying disease, but on the intensity and duration of immunosuppression. Since lupus is a multisystem disease, the outlook does not of course depend only on what happens to renal function, especially now that this is treatable by dialysis and transplantation. Long-term results are now very encouraging compared with 20 yr ago (Tables 4 and 5) (1,21,23). However, many questions remain unresolved: Will those showing reduced renal function evolve eventually into renal failure? What is the significance of persistent proteinuria in the absence of disease activity? How can treatment be optimized to allow cessation of treatment? The overall causes of death in lupus (Table 6) are much more varied than in other forms of primary glomerulonephritis, in which renal failure is the dominant cause. It must be remembered that the data in this table cover a considerable time span, and that they may not reflect contemporary events—particularly in relation to treatment-related deaths such as sepsis. Only 10 to 15% of patient with lupus nephritis now go into end-stage renal failure (15,17), and sepsis is the principal cause of actual death in lupus nephritis. Extrarenal lupus affecting the central nervous system or lung are prominent, and almost half of all lupus deaths are due to excess cardiovascular mortality, particularly from premature myocardial ischemia in long-term survivors. When renal failure supervenes, this is usually within the first decade of follow-up (15). The proportion of patients in end-stage renal disease who have “burnt-out” lupus has been exaggerated: Most patients on dialysis still require immunosuppression (18). Transplantation achieves results comparable to other groups of patients (19,20), and recurrence of lupus nephritis in the allograft (21) is rare and probably its incidence has been overestimated, since the glomerular appearances have not often met strict criteria for lupus nephritis in published reports. There has been more controversy than agreement concerning which features might be associated with a poorer outcome in lupus nephritis (1,15,17), and data useful to the clinician are scant. Clinical factors influencing outcome in some series—but not others—are: age at onset greater than 55 yr, childhood onset, black race, raised plasma creatinine, and hypertension. Indices of clinical activity, number of American Rheumatism Association criteria present at onset, and the number of clinical relapses also predict outcome in some studies. On renal biopsy, today there is little or no difference in outcome between different WHO classes of nephritis in treated patients, although extensive subendothelial deposits and tubulointerstitial changes point to a poorer prognosis, as do the number of macrophages and T cells in the infiltrate. Crescents have also been related to a poorer prognosis, as in other forms of nephritis, but very extensive crescentic disease is relatively uncommon in lupus. Vascular lesions within the biopsy and intraglomerular capillary thrombi have been associated with unfavorable outcomes also, although the latter observation has been contested. Calculation of activity and chronicity indices allowed the National Institutes of Health (NIH) group to identify clear groups of high and low risk for a poor outcome, and also permitted therapeutic decisions, especially when and when not to use aggressive treatment, although these data are not supported by all other analyses. Among laboratory tests, correlations between complement concentrations, levels of circulating anti-dsDNA antibody, and outcome have been reported, but are not useful in practice. The strongest laboratory predictor of outcome is anemia, with thrombocytopenia, hypocomplementemia, and a raised DNA binding at onset all correlated with a poorer evolution. In the treatment of lupus nephritis, we are dealing with two quite distinct therapeutic problems: (1) the induction treatment of severe acute life-threatening disease, often affecting many systems and usually near the onset of the disease; here, the threat of the disease is paramount; and (2) the maintenance treatment and long-term management of chronic, more or less indolent disease, during which protection from the side effects of treatment becomes more and more important (1,22, 23, 24, 25, 26, 27, 28, 29, 30, 31, 32, 33, 34, 35, 36, 37). The evidence for treating all but the mildest types of lupus nephritis with corticosteroids is very strong, but no prospective trial directly comparing a corticosteroid-treated group with one not so treated has ever been performed, nor is such a trial likely to be conducted in the future. In most patients with absent or trivial urine abnormalities, the biopsy appearances will be bland, the outlook good, and treatment unnecessary. Whether treatment with corticosteroids at this point might prevent subsequent evolution of severe disease has never been tested. There is equally little evidence that early treatment of those with minor but definite urine abnormalities, but normal renal function and mild histopathologic appearances (WHO class II), alters subsequent evolution. Nor is the evidence clear on whether the outcome of membranous nephropathy (WHO class V) improved after treatment, although most clinicians would treat patients with this pattern. Certainly, a proportion of such patients evolve slowly into renal failure. Therefore, it is in those groups with focal proliferative nephritis of varying severity (WHO class III), or severe diffuse proliferative nephritis (WHO class IV), where immunosuppression seems to have the most to offer. Again, however, no prospective trials have been done to see whether maximum benefit is obtained by “tailoring” the treatment to the histology in this way. However, it is difficult to argue with the dramatic improvement in outlook described in the previous section. Corticosteroids. Oral corticosteroids in high doses (starting with 60 mg/24 h) carry a heavy penalty in terms of side effects. Thus, today many clinicians believe “pulse” intravenous methylprednisolone, together with low-dose oral prednisolone (10 to 20 mg daily), can reduce the incidence of these side effects, particularly on facial appearance. This is of course provided that treatment is limited to a maximum two courses of 3 days' intravenous 0.5 to 1 g methylprednisolone. Side effects described after intravenous injection of high doses of corticosteroids include cardiac arrhythmias or even cardiac arrest if given through central venous lines, and unpleasant flushing sensations. Acute hypertension may be seen, and occasionally acute psychosis. All of these complications seem to be more common in children and adolescents with lupus. It is difficult to say whether results are better in terms of cost and benefit using “pulse” methylprednisolone than with conventional high-dose oral steroids, since the only controlled trial reported thus far mainly concerned patients with nonrenal lupus, and involved only small numbers. Cytotoxic Agents. Donadio and Glassock (22) examined this subject extensively, and came to the conclusion that there is no good evidence that the addition of cytotoxic agents, such as cyclophosphamide or azathioprine, improve outlook in the acute (or the maintenance) phase. Nevertheless, today most physicians still use a cytotoxic agent in the acute phases of severe lupus nephritis (23), and this behavior is supported by meta-analyses of controlled trials (24,25). Cyclophosphamide has the advantage in the induction phase that it is a much more powerful inhibitor of B cells than azathioprine, and the resynthesis of autoantibodies is reduced to normal levels rapidly and efficiently. Therefore, most physicians prefer it for induction therapy. Whether there is extra benefit in giving cyclophosphamide by the intravenous route during the acute phase is unproven. Despite this, intravenous cyclophosphamide is commonly used, although it does not seem logical to use a drug intravenously, which was specifically developed for oral use, when one of its active principles (nitrogen mustard) is available as well. Also, the drug has to be extensively metabolized before it is active, so that (unlike methylprednisolone) there is no immediate effect. Since the patient is usually in the hospital at this point, compliance should not be an issue. Plasma Exchange. Although there is an obvious rationale for plasma exchange in lupus, a role in acute severe lupus nephritis has not been established. The two completed controlled trials (26,27) showed no benefit of the addition of a three times weekly plasma exchange over conventional combined cytotoxic and corticosteroid therapy, and another recent trial failed to show benefit when intravenous cyclophosphamide was synchronized with the plasma exchange to minimize antibody rebound. Other groups have used even more intensive courses of exchange (one plasma volume daily for 7 to 10 d), but it is unknown whether this extra treatment confers benefit. Thus, plasma exchange cannot be recommended except in patients with associated severe cryoglobulinemia, hemolytic uremic syndrome, or possibly vasculitis; however, many physicians continue to use it as a treatment of desperation when all else has failed. A suggested guideline for the treatment of the acute phase of lupus nephritis as used in our hospital during the past decade is shown in Table 7. Usually, the acute disease will be under control after 12 wk or less, although occasional patients may have a stormy course and require several extra courses of `pulse' methylprednisolone. The balance of benefit between strategies to avoid relapses or smoldering disease activity, and the many side effects of the drugs used to achieve this are poorly evaluated, despite a number of controlled trials and a large amount of anecdotal information. Corticosteroids. Corticosteroids remain the basis of treatment in the maintenance as well as the acute phase; no studies of other treatments without prednisolone have been attempted. To minimize the side effects of long-term corticosteroids, dosage should be limited to prednisolone 5 to 15 mg daily or equivalent. Daily and alternate-day regimens have not been formally compared in lupus, but the latter are often used in children to maximize growth. Monthly “pulses” of methylprednisolone have been used, but again the toxicity and benefits of this regimen have never been investigated. Prednis(ol)one has been almost universal, although side effects of deflazacort seem to be less in other diseases. Cytotoxic Agents. Meta-analyses (24,25) came down unequivocally in favor of an additional clinical benefit of cytotoxic agents when added to corticosteroids in the maintenance phase. Another crucial observation is that the long-term follow-up data from the NIH trials have shown less progression of renal sclerosis at 10 to 15 yr in those groups treated with a cytotoxic agent than in those treated with prednisolone alone (28), although importantly it was not possible to distinguish in this analysis any difference between the various cytotoxic drugs used or the route of administration. In these studies, only groups treated with intravenous cyclophosphamide showed improved survival in contrast to a group of (partially historic) control subjects treated only with prednisolone (29,30). Again, it is important to note that there was no difference in clinical outcome between those treated with either oral or intravenous cyclophosphamide versus azathioprine, and the difference in outcome between the intravenous cyclophosphamide group and those treated with prednisone alone did not become apparent until more than 5 yr of follow-up had been achieved (30). Oral cyclophosphamide cannot be given for longer than about 12 wk because of bladder and gonadal toxicity, and therefore, unlike the acute phase, it has no place in maintenance therapy. Therefore, regular monthly, then bimonthly intravenous cyclophosphamide has been advocated for periods of up to 2 yr or more, because as just noted the results in medium and long-term were statistically superior to those obtainable with prednisolone alone (29, 30, 31), even though there was no difference from those obtained using azathioprine. However, it has become evident that the intravenous cyclophosphamide regimen, like prolonged daily oral treatment, carries a considerable risk of gonadal damage, with late menarche and early menopause a regular finding in a dose- and age-dependent manner, with older recipients showing greater toxicity (32). This may be a particularly important point in the many transpubertal children with lupus, who however probably tolerate the treatment better. Gonadal damage could in theory be limited by giving the pulse timed so that a developing follicle is not present. Pregnancy cannot be contemplated during such treatment, although it may be possible at a later date in those who do not become sterile. The oncogenic risk of such regimens may not be evident for many years and, apart from that in the bladder, remains present whatever route of administration of cyclophosphamide is used. However, a major advantage of the intravenous regimen is that in noncompliant patients it permits low corticosteroid dosage, with acceptable effects on appearance, and the treatment can be given under observation. Azathioprine in doses of 2 to 2.5 mg/kg per 24 h has proved remarkably safe in the very long term (1,15,23,33), although macrocytosis is very common and higher doses will induce leukopenia. Previously, we used this agent during the acute phase of the disease but in the past decade we have used initial oral cyclophosphamide, and then transferred patients to azathioprine after 12 wk induction (Table 7). There is evidence that the addition of azathioprine does not increase infections (which mostly depend on corticosteroid dosage). Both azathioprine and cyclophosphamide almost certainly have a steroid-sparing effect. Azathioprine has only a very small oncogenic potential; pregnancy during maintenance azathioprine can be encouraged, and is safe. Pancreatitis and hepatotoxicity are very rare. In lupus nephritis, long-term results as good or better than the best obtainable with cyclophosphamide, by whatever route, can be achieved by initial intravenous methylprednisolone, 12 wk oral cyclophosphamide, followed by combined azathioprine and corticosteroids. In practice, a choice of cytotoxic agents is useful (34). In my view (23), there is no evidence as yet that intravenous cyclophosphamide offers a better cost-benefit ratio in the long term than azathioprine, and no trial directly comparing these two regimens has yet been completed. Chlorambucil has been used on occasion as an alternative, but its gonadal effects and oncogenic potential are, if anything, greater than cyclophosphamide. Mycophenolate mofetil has been used recently in limited clinical trials with encouraging results, however, more data are awaited. Cyclosporine. Cyclosporine might be expected to benefit patients with lupus because of its powerful effect on helper T cell clonal expansion through inhibition of interleukin-2 synthesis. Limited evidence suggests that a dose of 5 mg/kg per 24 h (chosen to avoid nephrotoxicity) produces a good response in some patients, although a relapse often follows withdrawal of treatment. There is no effect in reducing anti-dsDNA antibody levels. Cyclosporine does not appear to be particularly useful in acute lupus, but can have a role in the maintenance phase as a steroid-sparing agent and for its effect in reducing proteinuria in very nephrotic patients. Intravenous Gamma Globulin. Intravenous gamma globulin has been used in a number of small series of patients with lupus, including those resistant to conventional treatments, with encouraging results (35,36). How it might act is speculative, but modification of anti-idiotype networks by the anti-idiotypic antibodies and effects on vascular biology are the most usual explanations offered. Various preparations and dosages have been used for periods up to 6 mo or 1 yr. Relapse after improvement is seen frequently. Transient decline in renal function may follow its use in nephrotic patients, the result in some cases of the osmotic effect of the sugar vehicle. Newer Forms of Immunologic Intervention. Patients with severe resistant lupus have been given total lymphoid irradiation. Results have been encouraging, with minimal requirements for immunosuppression subsequently, but the use of this technique on prepubertal or transpubertal subjects raises extra worries. Even more radical approaches have been used in very resistant disease with major treatment side effects, including marrow ablation and reconstitution. These approaches are still experimental, as are newer less dramatic immunologic strategies, including the use of monoclonal antibodies and molecular blockers to interrupt specific elements of immune recognition (37), which should in theory have a major role to play. Serologic Tests in Monitoring Effects of Treatment. Although persisting anti-dsDNA antibody may be associated with subsequent relapses, a number of patients maintain elevated levels for years without relapse, and there is a fine balance between under-treatment and over-treatment. In our opinion, the main value of DNA binding levels is that normal values usually permit safe reduction of treatment during the chronic phase. Likewise, complement concentrations are of limited value during the acute phase in severe nephritis; clinical and biochemical data are almost always sufficient. A number of other treatments have been used for lupus nephritis, but have not yet made a major impact on clinical practice. Ancrod defibrinates the patient effectively with a surprising lack of side effects, and Pollak's group have reported excellent long-term results even in severe progressive nephritis. This treatment deserves further evaluation. Indomethacin has also been used in lupus, but in view of the fall in GFR in lupus nephritis using any nonsteroidal anti-inflammatory drug, and the potential of this type of agent to induce interstitial nephritis, this approach has not proved popular. Thromboxane synthetase inhibitors or thromboxane receptor antagonists have not been evaluated. Antimalarials seem to be ineffective against lupus nephritis, either alone or to reduce steroid dosage. The ω-3 unsaturated eicosapentanoic acid (EPA) has been shown to protect mice from lupus nephritis, with a reduction in anti-dsDNA antibody titers, whereas a high saturated fat diet accelerates the disease. A controlled trial of EPA in human lupus showed favorable short-term effects on hematuria, blood lipids, and hemostatic parameters; anti-dsDNA titers were not affected. No benefit has yet been shown on nephritis. Effects on hemostasis and lipids are particularly attractive in view of the accelerated vascular disease reported in young women with lupus, which is a major cause of late morbidity and mortality. When Can We Stop Treatment in Lupus Nephritis? The goal of long-term management in patients with lupus nephritis is suppression of disease with minimum side effects of treatment. This balance is not easily achieved, but close attention to the details of individual patients can improve performance. Repeat renal biopsies may suggest whether a slow decline in renal function with proteinuria is the result of active glomerulonephritis, or of secondary sclerosis, which at the moment we seem powerless to arrest. Stable renal function, lack of proteinuria, and normal immunologic tests are signs of success. Although occasional patients will relapse more than 20 yr from onset of disease when treatment is reduced, it is often possible to stop treatment altogether after 5 yr or more even in patients with very severe lupus at onset, whose disease will have apparently “burnt out,” although a proportion may relapse. Complications (Table 8) will be seen in up to half of treated patients with lupus. Some, such as sepsis, bone necrosis, neoplasia, and thrombosis, are more common in untreated lupus, and the treatment facilitates the complication (1,15). Other complications are purely those of the treatment used. Some form of sepsis is by far the most common complication seen and is related to the dosage of corticosteroids, not azathioprine (38); herpes zoster is particularly common in younger patients; early treatment with acyclovir should always be given to avoid dissemination. Pyogenic meningitis can be a major problem and Cryptococcus should be excluded in any lupus patients with meningitis. The C-reactive protein concentration is useful (but not specific) in distinguishing relapse of lupus from infection, because there is usually only a minor rise with exacerbations of disease. However, with improvement in survival, accelerated atherogenesis has emerged as a major cause of later mortality. Myocardial infarcts have been reported in very young patients, in the absence of vasculities. Possible risk factors for atheroma in lupus include corticosteroids and hypertension even in children, and in a minority the added vascular risks of end-stage renal disease. Thromboses present in about 12% of patients, and their occurrence should prompt a search for antiphospholipid antibodies and other procoagulant abnormalities. Almost any vessel in the body may be affected, but venous thromboses form the great majority. However, if an antiphospholipid antibody is present, arterial thromboses may be seen more frequently, with cerebral thrombosis being particularly common. Inferior venal caval thrombosis is seen, and pulmonary embolism is common, perhaps causing the pulmonary hypertension. Unilateral or bilateral renal venous thrombosis is frequent also, especially in the pattern of predominant membranous nephropathy. A number of patients with a mixed picture of lupus and thrombotic microangiopathy have been described, who may develop acute renal failure and in general have a poor prognosis. Curiously, steroid-induced diabetes is rare despite prolonged dosage in many patients. The excess of neoplasia principally involves lymphomas (which may be intracerebral) and carcinoma of the cervix.